A highly detailed and interesting article that explores the origins of the war. The origins of Britain’s war with the United States lay in the former's war with France, which had raged relentlessly since 1793, and also in the conflict with the Native Americans. You see, the United States had declared itself neutral in the European war, a stance which angered the French, who felt it was poor recompense for supporting the Americans during the Americans during the American Revolution. 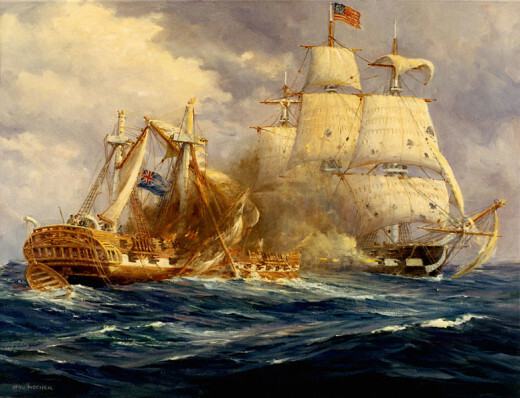 Between 1798 and 1800 an undeclared naval war (the Quasi War) was fought between the US and France, with battles between warships and attacks on merchant shipping. British and US relations became strained in the following years, with the US navy objecting to the Royal Navy blocking their trade with France and forcibly recruiting sailors from US ships intercepted at sea. The Americans also alleged that the British in Canada were stirring up trouble among the country’s Indian tribes, accusing them of supporting the tribal confederation led by the Shawnee leader, Tecumseh, which was opposing the expansion of the United States in the northwest. 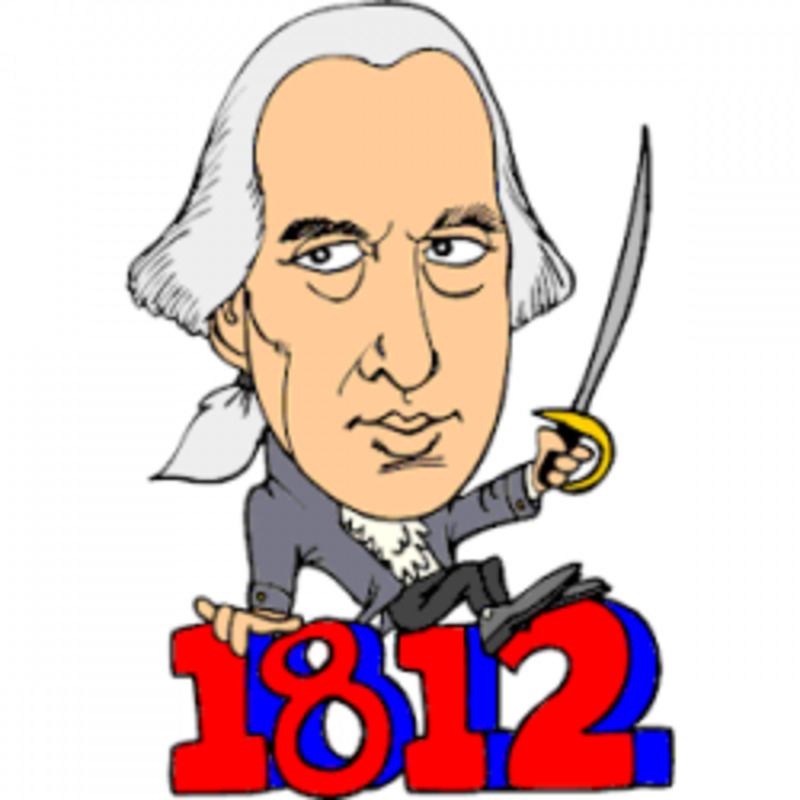 The United States officially declared war on Britain on the 18th June 1812. 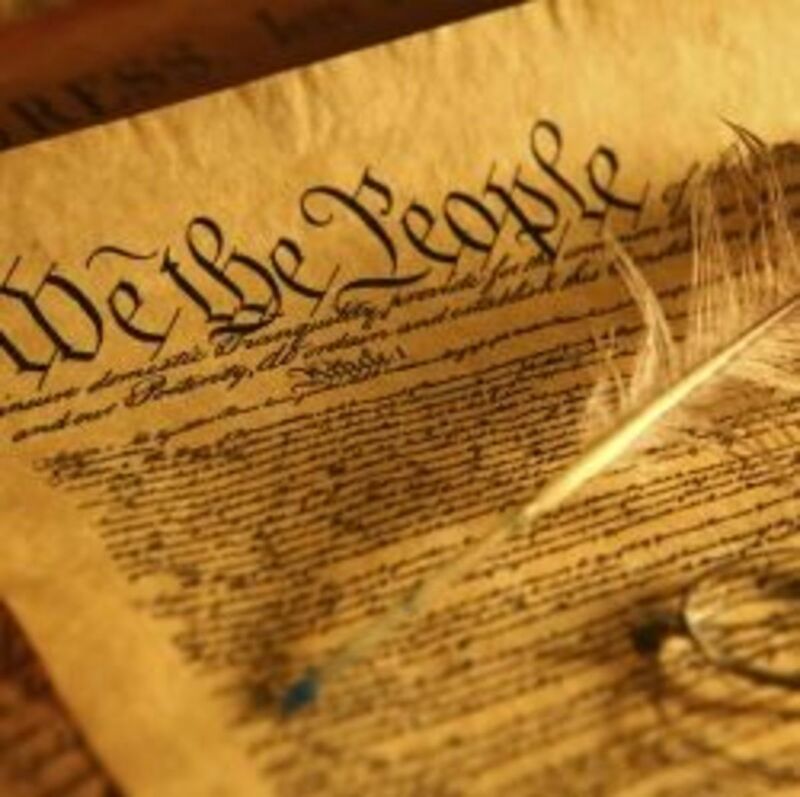 It was a rather controversial decision, pushed through by President James Madison and the ‘war hawks,’ many of whom were aggressive advocates of American expansion. However, the United States was ill prepared to fight. While the small standing army was supplemented by short term volunteers, the Americans relied heavily on state militias. Madison was convinced that these forces would be adequate enough to occupy Canada. This was possible in principle, as Britain’s greater resources were concentrated on its war with France, leaving minimal forces in Canada. Yet a US invasion of Canada launched in August 1812 degenerated into an utter debacle. The three pronged attack was defeated by only handfuls of British soldiers, Canadian militia and Indian tribal warriors. These setbacks for the United States on land were offset by stirring naval victories. Overall the US Navy was no match for the Royal Navy. The British had more than 700 warships. America possessed only 17 warships, none larger than a frigate. The Royal Navy’s main force, however, was committed to blockading French ports and could not be spared for the American war. US frigates, more heavily armed than the British ones and manned by determined and skilful officers and crew, were well suited to solo raids. It was a shock to British pride when the USS Constitution triumphed in successive single combats with the British frigates Guerriere and Java, and the USS United States captured the frigate Macedonian. American warships and privateers also took a heavy toll on British merchant shipping. The most important American naval victory, however, was won on Lake Erie. Commandant Oliver Perry was given command of a small squadron of warships that were built on the spot to contest British control of the lake. On the 10th September 1813, Perry took on, and defeated a roughly equal British force. By controlling the lake waters, the US retook Detroit, which it had lost the previous year, thus securing Ohio. This defeat also sealed the fate of Tecumseh, leader of the Shawnee tribe, who was fighting alongside the British. When his allies retreated from Detroit, he had no option but to follow, pursued by the Americans under William Henry Harrison. 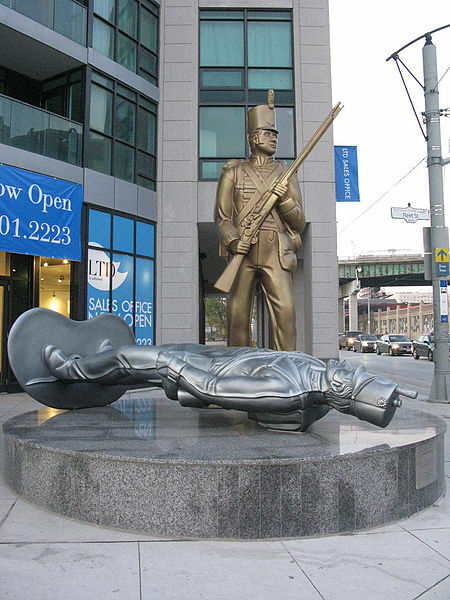 In 1813, at the battle of the Thames, the British and Indians were crushed; Tecumseh was slaughtered. While the pressure of conflict and the passage of time, the United States’ army developed greater discipline and found better leadership. General Winfield Scott (‘Old Fuss and Feathers’) emerged as an American hero in summer 1814 when the US mounted a second and more competent invasion of Canada. 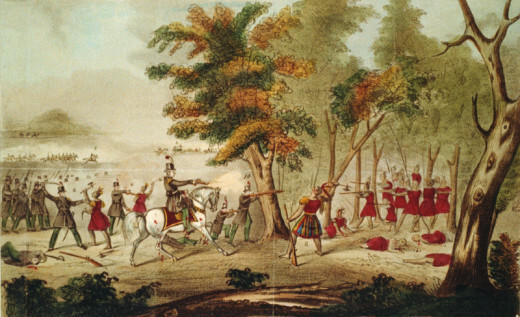 He led his men to victory against the British in a sharp battle at Chippewa and then was badly injured in a fierce encounter at Lundy’s Lane (present-day Niagara Falls) in July. Far to the south another American made his mark fighting Native Americans; Colonel Andrew Jackson, in charge of the Tennessee militia. A Creek faction known as the Red Sticks has begun fighting against the United States. In 1814 Jackson’s militia, supported by other Creek and Cherokee Indians, fought a campaign against the Red Sticks, defeating and massacring them at the battle of Horseshoe Bend in March. 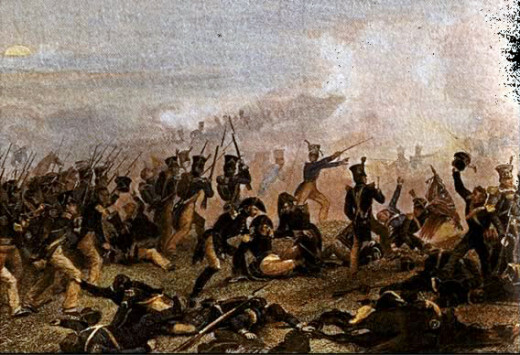 In spite of these successes, by 1814 the war was turning against the United States. In Europe Napoleon was deposed in April, freeing up British troops and warships. Despite the feats of the American sailors, the power of the Royal Navy was making itself felt. The American frigates USS Chesapeake and Essex, salvaging British naval pride. An ever tightening blockade of the United States’ coast impacted severely upon the American economy and government finances. 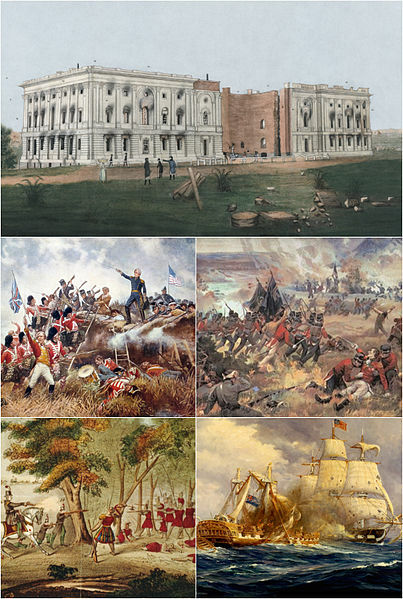 Free to attack the eastern seaboard at will, the British sent troops recently arrived from Europe to raid the American capital, Washington DC, in August 1814. Commanded by General Robert Ross, they brushed aside militia defending the city and burned down public buildings. The following month the British moved on to Baltimore, but despite landing troops and a naval bombardment with mortars and rockets, they were unable to take the stoutly defended Fort McHenry guarding the port. In the same month the British took eastern Maine, but an invasion of New York State from Canada failed. Sir George Prevost escorted an army as far as Plattsburgh city on Lake Champlain, but Prevost’s accompanying naval force was defeated by an American lake squadron and he was forced to withdraw. By this stage both sides were tired of the conflict. The only point in continuing the fight was to manoeuvre in order to gain a potential advantage in the peace negotiations that had opened at Ghent in Belgium. The British decided to grab New Orleans, Admiral Sir Alexander Cochrane leading a body of soldiers from Jamaica. On the 8th January 1815, under the cover of darkness, an army commanded by Sir Edward Pakenham attempted a frontal assault on fortifications defended by the American general, Andrew Jackson and his 5000 determined men. Pakenham was among those struck down by American fire before the whole operation was finally abandoned. The troops were unaware that a peace treaty, the Treaty of Ghent, had been signed two weeks earlier. News of it however, would not arrive until February. The only real territorial change resulting from the War of 1812 was the US gain of Mobile from Spain, and they were not even fighting. But there were also other consequences. The war stimulated an upsurge of national consciousness both in the United States and Canada. 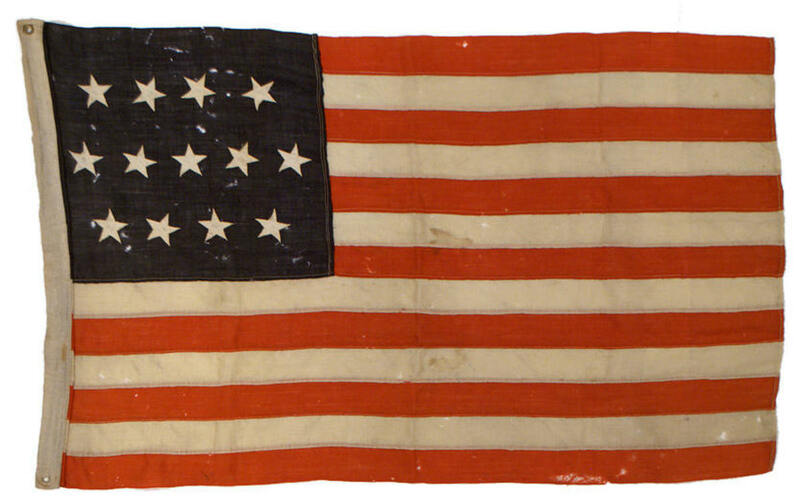 The ‘Star-Spangled Banner,’ written by Francis Scott Key during the assault on Baltimore, was later to become the US national anthem. It was to prove America’s last war with Britain, however. 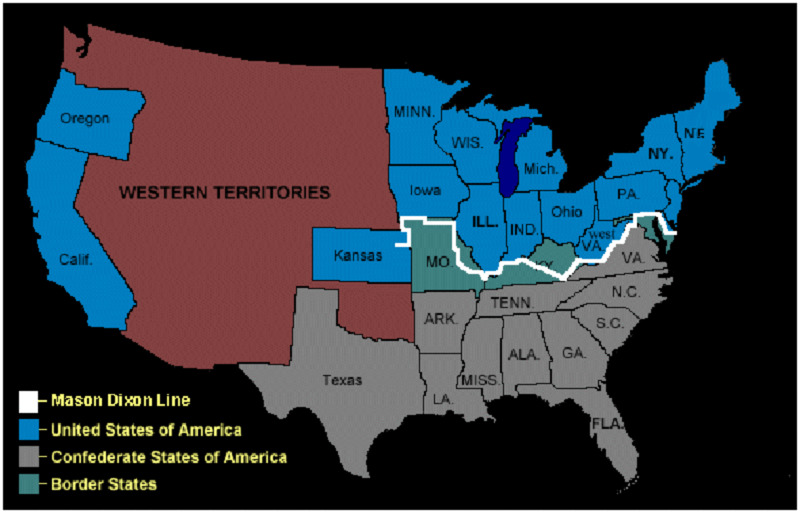 Further disputes over the US-Canadian border were determined by agreement in the course of the 19th century. The war brought freedom to thousands of black slaves who escaped their American owners by joining the British. For Native Americans, the war brought further subjugation. Andrew Jackson led attacks on Native Americans and escaped slaves in Florida in the Seminole War in 1817-18; Florida was ceded by Spain to the US in 1819, becoming an area where slave owning was legal. 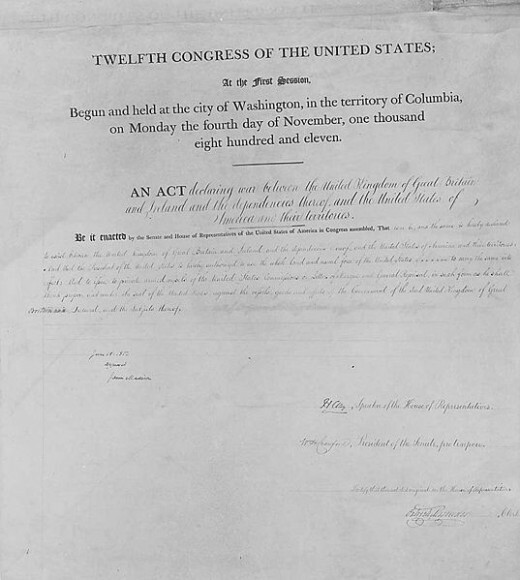 After Jackson became President in 1829, an Indian Removal Act was passed, ensuring the eviction of Cherokee, Creek, Chickasaw, and Choctaw from their tribal lands. They were forced along the ‘Trail of Tears’ to the Indian Territory (mainly in present day Oklahoma) in the 1830s. Well overall that is what happened but we British can point out that when we entered Washington under a flag of truce we were fired on by the Americans. 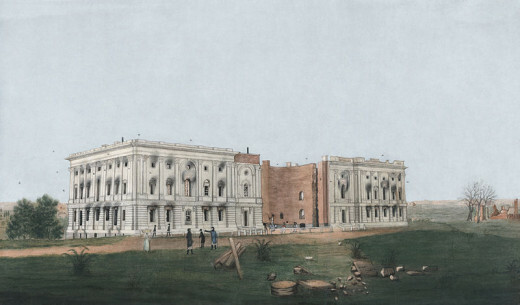 Consequently, because of this act we burnt down a lot of buildings including The White House. The British as you will know during this occupation behaved with all courtesy to the habitants. 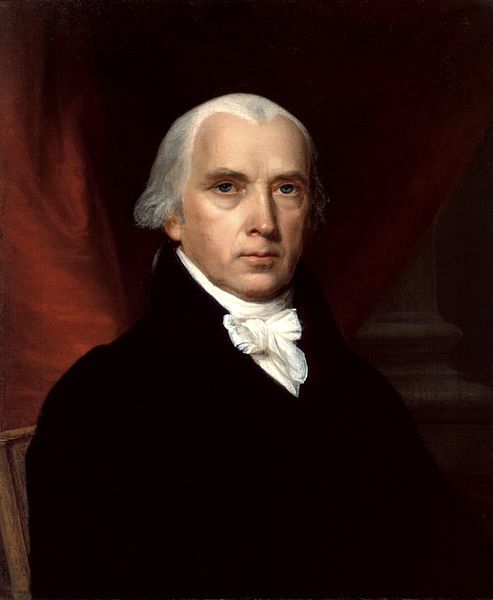 The Canadians stopped the invasion of Canada and it can be argued that Madison and indeed Jefferson thought that they would have a repeat performance of 1776 when Britain would be fighting on two fronts with a fear by Britain of France invading England while we were busy to an extent in America. This did not go to Madison's plan. A wonderful history lesson and I vote up,across and share all around. Thanks Mike, it's strange how many national anthems have military connotations. There's the La Marseillaise, the Real Marca and even the original version of God Save the Queen contained lyrics relating to crushing the rebellious Scots. Thanks for popping by. Thank you very much, the same can be said for both World Wars, as it took several days at least for news of their respective ends to filter through to the troops. I remember reading about Japanese soldier who continued fighting alone in the jungle until 1974, they actually had to fetch his old CO (long since retired) to inform him that the war had indeed ended. Thanks for popping by. Thank you Chris, it seems strange that David Cameron felt compelled to apologise, when, as you say it was the Americans that declared war on us; and also the fact that it happened 200 years ago. By that logic does that mean that Francois Holliande should apologise on behalf of the French Republic in two years time for allowing Napoleon to return from exile and initiate another, ultimately brief war that culminated in Waterloo. If Cameron's still the PM, I wouldn't be surprised if he asks for one. Good and very fair account of this war. I was very ashamed last year, when David Cameron almost apologised in Washington for the burning of the White House. The Americans had brought that on themselves. 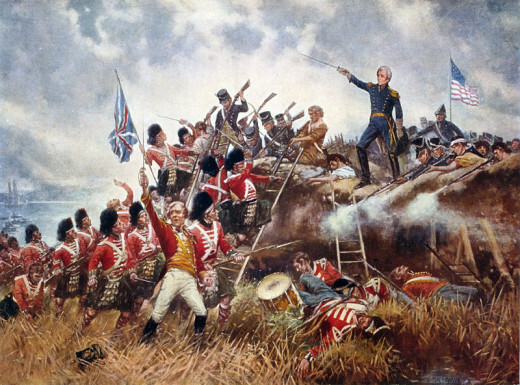 I venture the guess that most Americans think of the War of 1812 as "what was that about?" You provide a very succinct readable thumbnail of this conflict. I have always found it amazing that the Battle of New Orleans was fought AFTER the war had ended. Our modern minds in the age of Google find it hard to get how slow communications used to be. Well done job James.